It is only the first day of 2010 but already the alien activity is much higher than we have previously seen. The above photograph captured part of the invasion fleet. My apologies for the poor quality of the shot but I was shaking so much from the excitement and I didn't have time to set the picture up so I used the auto feature on the camera. A series of orange balls were seen. 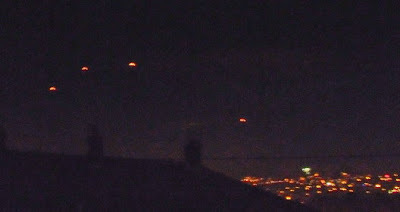 They moved from close to the ground on the right side of my window (which would have put them very close to the town visible in the lower right of the picture, to the left side of the window but higher up. So basically they were rising slowly from close to the ground on my right to a higher area of sky on my left in a gentle curve. They moved quite slowly at a constant speed, flickering gently as they went, which I presume was the lights of the crafts being disrupted by either the heat of the crafts themselves or something to do with their energy fields. Who knows? I'm not an alien. Many craft made the same journey from close to ground to upper sky before vanishing, sometimes only one was visible to me at a time, sometimes 3 or 4. I presume they activated some kind of jump drive at that point to reach escape velocity. Perhaps it is dangerous to use that drive too close to the ground. I should of course mention that the time when I saw these craft was 00:20 on 1st January 2010 at the same time as a lot of fireworks were going off in the town. (One can even be seen on the photo). The alien fleet was completely unafraid of the fireworks! OK no, but really. Are these a new type of boring firework that shoots up like a rocket but then travels across the sky really slowly, flickering as they go for like about 2 or 3 minutes each, or are they some kind of paper lantern being blown in the wind? Enquiring minds want to know. Let's flood the house a bit!